Shouldn’t we honor those who serve any time of year? Even if they’re ‘heathens’? Even if they dissent? Even if they’ve been in jail? Following is a blast from the past from all of six months ago. I bicycled downtown to USX Plaza before Christmas. After photographing the plastic baby Jesus with Joseph, Mary and the Shepherds in the giant crèche, I wheeled my bike across the street to the Occupy Pittsburgh site at BNY /Mellon Park. It was filled with tents but seemed mostly deserted. I walked up the path into the park and approached the chain link fence surrounding the silent fountain. I parked my bike and sat reading the signs people had hung there. One was a quote by Andy Warhol praising the durability and design of U.S. currency, which he had thrown in the East River in New York City (which I daresay Campbell’s tomato soup cans had allowed him to do unlike most of us). A woman bundled up against the 30-degree temperature walked by without saying anything. A guy with a thick beard walked by wearing what looked like red and black checked pajamas. Pieces of cardboard were laid on the dirt between the tents. Someone had hung an American flag with thirteen stars. As I stood up to walk further up the path three men approached. One of them who appeared to be in his late fifties had a beard and wore a flannel shirt. I introduced myself to him as he passed and said I was doing research on dissent. The other two came over. One, a tall, dark-haired man, began talking about Marcellus shale drilling. I started to make a lame joke, then stopped. “No, I wouldn’t,” I answered. I asked if he were from Pittsburgh. He said his name was Standing Bear. I asked what brought him to Southwest Pennsylvania. “I was in prison there,” Standing Bear explained. “Where do you live? Do you have a job?” I asked. I said I guessed they’d be taking down the tents. BNY/Mellon had said they had to be out of the park by Sunday. “No, man! We’re not leaving,” exclaimed, Rick. He told me he was “born and bred in Pittsburgh”. I asked Standing Bear the reaction of people to the Occupy Pittsburgh site. “From her car. Can you believe it?” Rick said. He shook his head. A young woman stood behind Standing Bear interviewing Rick with a video camera and microphone. The sun had starting going behind the buildings. It felt colder than thirty degrees. “I served my country. I’m a first Gulf War vet,” Standing Bear said. “Tell him you were in prison,” Rick said. He laughed. I told Standing Bear I’d been involved with an employment networking group. I had proposed a resume-writing and job skills workshop to Veterans Leadership Pittsburgh to help vets translate their experience to civilian jobs. I shrugged. “Doesn’t the military help you with these kinds of things? Like job searches?” I asked. I observed that might be a compliment given the behavior of some people who called themselves Christian. I asked Standing Bear if I could see his tent. I followed him outside the Occupy site and down the sidewalk. Across the street music played from the creche in USX Plaza. Something about peace and goodwill toward all men. The structure looked big enough to hold everyone in the camp– providing a roof and shelter from the wind to flesh-and-blood occupy residents in place of inanimate plastic religions icons. I read in the newspaper that the Pittsburgh Catholic diocese spent $50,000 each year putting the creche up and taking it down again. Celebrating the glory of God and Jesus’ birth cost a decent yearly salary for a bus driver, say, or a teacher. We stopped at Standing Bear’s tent at the perimeter of the Occupy site. I looked inside Standing Bear’s tent. 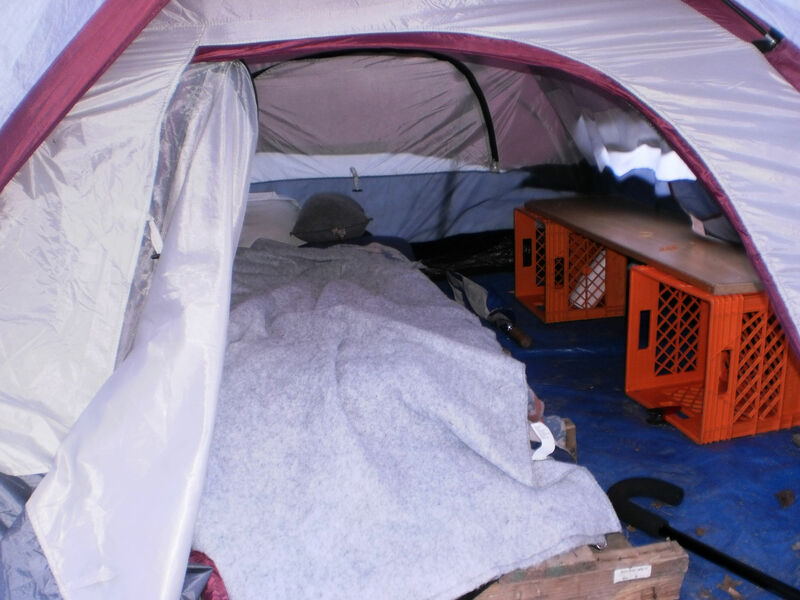 It had a raised platform for sleeping and a board set on two milk cartons for a shelf. I knew from my own camping that the ground would drain the heat from your body. It looked almost cozy – if you had to spend the winter in a tent. “I winterized it. I’ve got two sleeping bags – one inside the other.,” he said. “I like the platform,” I commented. “You’ve got a little vestibule here.” I pointed to the tarp rigged above the tent opening. I looked across at the other tents huddled in the park. We could have been two campers comparing notes about equipment instead talking about a Quixotic endeavor whose end was only a matter of time. Standing Bear and I walked back to the fountain and the chainlink fence. My bike leaned where I had left it against the bench. The signs waved in the breeze. Standing Bear and I talked a little longer. I thanked him for sharing his story. Then I said I had to go. The sun had dropped further behind the buildings that looked down on us. The temperature had fallen. My hands were freezing. Extremely Nice post, Preserve creating in this Style of language. I like it. I have Bookmarked your web site and I will maintain studying it. Its superb as your other content : D, appreciate it for putting up. “The art of love … is largely the art of persistence.” by Albert Ellis. Hmmm. Albert Ellis, being the founder/creator/inventor of the ludicrous REBT (oh just google it), has always seemed to me an alarmingly out-of-touch psych guru. But if this quote can be actually attributed to him, perhaps he’s not as big a dork as I thought.